Berkeley Lake is a wildlife sanctuary for bird and wildlife lovers. 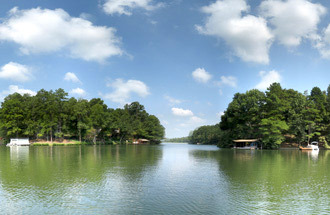 Berkeley Lake is located between Peachtree Industrial to the south and the Chattahoochee to the north. 1953, some 25 property owners met and formed the Lake Berkeley Civic Association. Besides zoning and developmental control, there were important needs such as electricity, telephones, and an "all year road" around the lake. This need for benefits that an incorporated city could help secure brought about the creation of our charter, which was approved by the General Assembly of Georgia on March 6, 1956. A new municipality to be known as the City of Berkeley Lake was created in Gwinnett County, Georgia. Over the years since the city's incorporation, a number of ordinances have been passed to protect the character and tranquility of our community. In addition, a comprehensive Master Plan for future land use and growth was developed and adopted. Since 1994, five new subdivisions have been added to nearly complete the development of all the land within the city limits. Only two tracts of over 10 acres remain.